To have joy in the midst of sorrow—or the current news feed—can seem impossible. And all on our own, it is impossible. But just as the angel Gabriel said after making his outlandish proclamation to Mary that she, a virgin, would give birth to the Savior of the world, “Nothing will be impossible with God” (Luke 1:37 nasb). 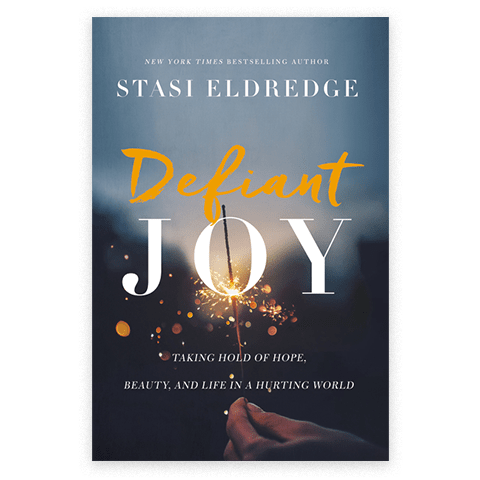 Joy is meant to be ours, a joy that is defiant in the face of this broken world. Our hearts are to echo the heartbeat of our joyous God. Now, this isn’t about skipping around in the garden singing, “I’m so happy in Jesus every day.” This is about being present to whatever may be coming our way and, in the midst of both the goodness and the grief, knowing joy. Believing that sorrow and loss do not have the final word takes defiance. It requires a strength of spirit that must be nurtured. It means engaging our lives fully but interpreting them by the highlight of heaven. Denying the truth of reality is not the answer; being fully present to it is.